A graduate of the U.S. Military Academy at West Point in 1915, Eisen­hower served in various capacities during World War I and the interwar years: in Texas, where he commanded a tank training center (1915–18); in Panama (1922–24); the Philip­pines (1935–39), where served under Gen. Douglas MacArthur; and in the States, where he severed as chief-of-staff to several generals (1933, 1939–41), catching the eye of George C. Marshall, U.S. Army chief-of-staff, who was tasked with expanding the 200,00-strong army. 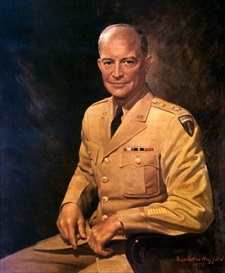 Marshall tapped Maj. Gen. Eisenhower, despite the latter’s lack of combat or high-command experience, to head the European Theater of Operations and command all U.S. forces in Europe. Eisenhower’s first active role was to plan and supervise Operation Torch, the successful November 1942 Anglo-American invasion in French North Africa. Following Torch was the successful invasion of Sicily, Operation Husky (July–August 1943). After the initial Allied landings on the Italian mainland (September–October 1943), Eisenhower, now a four-star general, left for England, where as Supreme Commander of the Allied Expedi­tionary Force, he planned Operation Overlord, the Normandy invasion (June 1944). The Normandy landings, hugely complex because it was an assault on Hitler’s Atlantic Wall by three armies—American, British, and Canadian—were an unqualified success, but driving from Normandy into the French heart­land only came toward the end of July. Paris was liberated on August 25, 1944, and by mid-September the Allied armies were approaching Germany itself at several points, only to be hindered from crossing the Rhine by overextended supply lines from the coast, a shortage of wharfs for unloading supplies, and the onset of winter. A risky, overly ambitious airborne and ground assault in Holland, Operation Market Garden, was a setback to finishing the war off quickly. In December the Germans made a desperate drive to divide the Allied armies with a thrust towards the pivotal Channel supply port of Antwerp, Belgium. The Ardennes campaign, better known in the west as the Battle of the Bulge (December 16, 1944–January 15, 1945), extermi­nated the threat and allowed Eisenhower, since December 20 a five-star general, to begin the final push from the west into Nazi Germany after he repositioned his armies and improved weather allowed Allied aircraft to return to the skies. On May 7 and 8, 1945, in Reims, France, and in Berlin, the vanquished leaders of the Third Reich (repre­sen­ta­tives of Reich Presi­dent Karl Doenitz’s short-lived Flens­burg Adminis­tration) signed the German Instru­ment of Surrender. May 8 was proclaimed V‑E Day (Victory in Europe Day), sparking celebrations in all Allied countries. Eisenhower remained in Europe as the military governor of the U.S. occupation zone, comprising the German states of Bavaria and Hessen and the ports of Bremen and Bremerhaven in Germany, until November 1946.